These Superfood Greens are packed full of nutrient dense plants like wheat grass, which contains large amounts of chlorophyll. This is a pigment that is in all green plants and associated with many health benefits. Wheat grass is also an excellent source of vitamins A, C and E, as well as iron, magnesium, calcium and amino acids. Of its 17 amino acids, eight are considered essential, meaning your body cannot produce them and you must obtain them from food sources. This along with the presence of several important antioxidants, including glutathione, as well as vitamins C and E, make this one powerful plant! These antioxidant compounds fight free radicals to prevent cell damage and reduce oxidative stress, which can accelerate the aging process, lead to degenerative diseases and even promote cancer. Thats not all! We added in chlorella, a single-celled green algae, which is packed full of nutrients normally only found in meat. One ounce of chlorella contains 16g of protein, 287% RDA of Vitamin A, 71% RDA of Vitamin B2, 33% RDA of Vitamin B3, 202% RDA of Iron, 22% RDA of Magnesium and 133% RDA of Zinc! Native to Japan and Taiwan, chlorella has a long history of being used to boost energy, support the immune system and fat loss, fight cancer and slow aging by reducing oxidative stress. Chlorella is also one of the few plant sources of vitamin B-12, which is very important for our vegan friends and other non-meat eaters. So much so, that a study from 2015 found that B-12 taken from chlorella helped to improve the health markers of 17 vegans and vegetarians between the ages of 26–57 years old with a history of B-12 deficiency. We keep the green machine rolling by adding in moringa leaf, known by over 100 names in different languages around the world. Native to the Himalayan mountains and parts of India and Africa, moringa comes packed with over 90 protective compounds, including isothiocyanates, flavonoids and phenolic acids. According to a report published in the Asian Pacific Journal of Cancer Prevention, moringa contains a mix of essential amino acids, carotenoid phytonutrients, antioxidants such as quercetin, and natural antibacterial compounds that work in the same way as many anti-inflammatory drugs. Not only that, but as a rich source of the amino acid tryptophan, moringa benefits neurotransmitter functions, including those that produce the “feel good” hormone serotonin. We're not done there! Spirulina is another great nutrient dense single celled microbe or cyanobacteria that is often referred to as blue-green algae. Spirulina was consumed by the ancient Aztecs but became popular again when NASA proposed that it could be grown in space for use by astronauts. Just like chlorella, spirulina is packed with nutrients. A single tablespoon or 7g of dried spirulina powder contains 4g of protein, 11% RDA of Vitamin B1, 15% RDA of Vitamin B2, 4% RDA of Vitamin B3, 21% RDA of Copper and 11% RDA of Iron. It also contains decent amounts of magnesium, potassium and manganese, along with trace amounts of almost every other nutrient you need. Gram for gram, spirulina may be the single most nutritious food on the planet! But wait, theres more! Peppermint leaf or mint in general is something many people go to at the first signs of an upset stomach, and with good reason. Mint is well known to sooth stomach aches and digestive issues. This is due to the presence of a compound known called menthol, which helps relax the muscles in the digestive tact, providing relief. Studies show that this may be especially beneficial for people with irritable bowel syndrome (IBS), a condition that causes symptoms like abdominal pain, constipation, diarrhea, nausea, bloating and cramps. In fact, it works so well that one double-blind, placebo-controlled study out of Italy gave people with IBS peppermint oil capsules for four weeks and found that symptoms were slashed by 75 percent. The last of these gracious greens that we use is matcha green tea. This tea has skyrocketed in popularity recently, with matcha shots, lattes, teas and even desserts appearing everywhere from health stores to bakeries. Matcha comes from the camellia sinensis plant like green tea, but it is grown differently and has a unique nutrient profile. Farmers do this by covering their tea plants 20–30 days before harvest to avoid direct sunlight. This increases chlorophyll production, boosts the amino acid content and gives the plant a darker green hue. 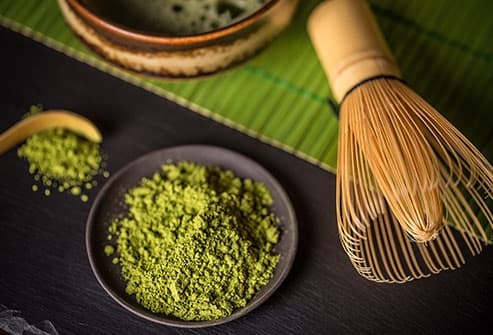 A process that results in matcha having greater amounts of caffeine and antioxidants that help stabilize harmful free radicals, which are those damaging compounds that are harmful to our cells and cause chronic disease. That covers the greens in the Superfood Greens, what else does this supplement have to offer? Lots! It has an "Energy, Focus & Endurance Blend," which features superfoods that are known to increase cognition and performance. These are time tested plants and herbs, including coconut water, ashwagandha, beet root and turmeric. Then we take things to the next level by adding in a "Prebiotic & Probiotic Blend." This blend of prebiotic "VitaFiber" and probiotic "LactoSpore" powders ensures optimal digestion and gut health, among the many other benefits probiotics have to offer.